In Mexico and around the world, January 6, 2015 became an international day of solidarity with the parents of the missing students from the Ayotzinapa rural teachers college in Iguala, Mexico. Vigils and protests took place all across Mexico, as well as in 20 U.S. cities. On the evening of Tuesday Jan. 6, 2015, up to 70 protesters in Los Angeles, California gathered outside of the Mexican Consulate-General across the street from L.A.’s historic MacArthur Park. My poster, Ayotzinapa Somos Todos, played a small role in the significant demonstration. You can view an article and photo essay about the demonstration that I have uploaded on my PATREON website, where you can also become my patron and directly assist in making such poster projects possible. 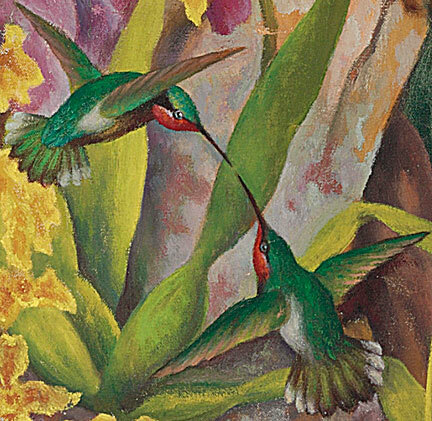 Detail of hummingbirds from Diego Rivera’s remarkable 1947 oil painting, "Portrait of Linda Christian." I have an aversion to the Orwellian truncation and mangling of English words and their meanings. Last year Lake Superior State University came up their 40th annual list of words that should be banished for their mis-use or uselessness; words like swag, foodie, curate, and enhanced interrogation. I would like to add to that list the words twitter and tweet. As a lover of the avian world and a keen bird watcher, I know that tweeting is something birds do. Nope, you can’t fool me. Up until just recently, to say that someone was “twittering like a bird” meant that they were inanely chattering about trivial matters. That does not sound like me, so I am certain many will be surprised that I have finally made the giant leap into the micro-blogging Twitterverse. Now, instead of long-winded rants and essays, I have to learn how to express myself with twitter-speak, 140 characters sprinkled with # and @ signs. Heavens above, Pablo Neruda sheds a tear! Although Twitter has been in existence since 2006, I must admit to not appreciating its potential until just a while ago. Specifically it was the mass protests in Mexico over the missing 43 students from Ayotzinapa Normal School, and how Mexicans were using Twitter in response, that finally woke me up and won me over. As is almost always the case when it comes to the truly important news of the day, I was completely frustrated by the near total lack of coverage the Ayotzinapa crisis in Mexico was receiving, not just from the mainstream media as I would expect, but also from the so-called “progressive/activist” news outlets as well. Undaunted, I turned to Twitter, and saw how the students, activists, workers, and protesters of Mexico were using the micro-blogging platform to spread their drive for true democracy, exchange images and ideas, create dissident culture, coordinate actions, and so much more. Not only that, people around the world were joining them; I wanted to jump into the fray myself, and the only way I could do that was by creating my own Twitter account. I look forward to using the platform to post announcements of artistic happenings, as well as news and links I find interesting as I research my writing projects; spreading the Art for a Change message to a larger international audience. I promise not to “twitter like a bird” over celebrity superstars and their lifestyles. Whether you are already a Twitter user, or have been perched on the fence about joining - I invite you to connect with me on the Twittersphere. Please visit https://twitter.com/mark_vallen and click the “Follow” button to receive regular updates! Dear Friends and Associates old and new. I have splendid plans for the Art For a Change project in this unfolding New Year, and I need a little bit of your help to make them come true. Recently I found out about a new website platform called PATREON, which is pulling together a community of artists, photographers, writers, musicians, and all manner of creative people; it allows supporters to directly fund their favorite artists. Patreon is similar to an ongoing art grant, but one financed completely by the people! The scourges of racism, war, poverty, and severe inequality that Dr. King confronted still plague U.S. society and the world, recent mind-numbing events in the news are proof enough. But where are the creatively maladjusted that King spoke of? 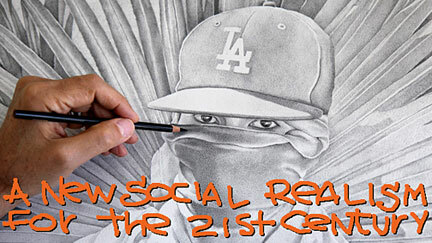 Clearly, the artists of today have not met the challenges of a world in crisis. The Art For A Change project hopes to nurture and encourage the “non-conforming minority”… but it cannot be done without your support. I have been creating socially conscious art for my entire career - and I have written this blog for the last ten years - all entirely without any outside funding or art grants. Patreon, meanwhile, allows creative people to receive regular monthly funding to support the imaginative things that they do. It provides a way for creative types to be compensated for their hard work, especially when it comes to work that is distributed online and often for free. The best part is, support can begin at just $1 per month! Plus, as part of an artist’s community on Patreon, supporters (patrons) can communicate with artists directly and get special updates on their work! Today’s admission prices to any of the major museums in the U.S., can run anywhere from $15 to $25 dollars per person; the entrance fee for two individuals attending a “special” exhibit at a museum is commonly $50. In the first half of 2014, Christie’s auction house sold $4.5 billion worth of overpriced artworks to society’s 1%. None of that has anything to do with making art accessible to the 99%, or helping the great majority of working artists in the U.S. to survive. It is time that artists and their enthusiasts take another path; by means of Patreon, the public now has a new ability to help directly shape the art world. I am excited to see what we can collectively accomplish in the months to come. Many of you have followed my works for years, some of you have just discovered this web log. I greatly appreciate that you find value in what I do, perhaps as much as I enjoy painting, drawing, and writing about art on this blog. Together, with your generous support, we can do so much more! * The quote from Jim Morrison came from an interview with him conducted for Creem Magazine by Lizzie James in 1970. Morrison died in 1971 at the age of 27. Creem Magazine published the interview in 1981 on the anniversary of Morrison’s death. 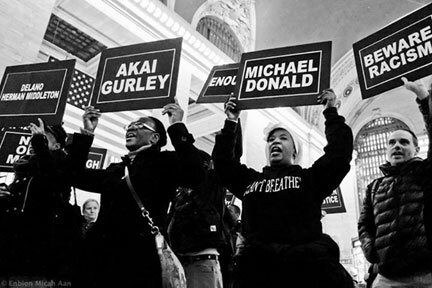 "Carry The Names" - 24 hour vigil at New York's Grand Central Station, Jan. 5- 6, 2015. Photo by anonymous photographer. On Tuesday afternoon, January 6, 2015, while evangelizing at New York’s Grand Central Station, the fire and brimstone preacher known as Reverend Billy was arrested on trumped-up charges of “obstructing governmental administration” and “disorderly conduct.” You might ask “who is that preacher man” and why was he Sermonizing at the nation’s busiest train station? Allow me to explain. 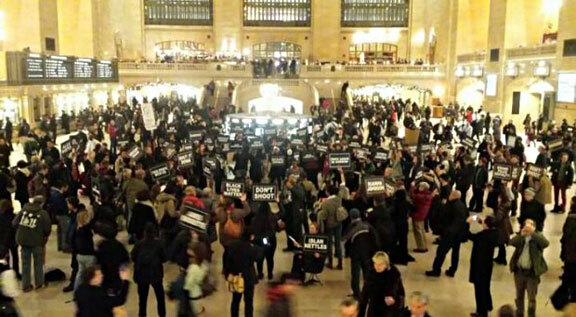 A coalition of activists in New York operating under the title, Carry The Names, decided to hold a peaceful, public vigil at Grand Central Station on January 5th and 6th, 2015. The vigil would be held to commemorate the victims of racist violence in the U.S. and to “bear witness with the names and stories of over 150 people killed or brutalized with impunity.” Most were killed by “legally-sanctioned extrajudicial violence,” that is, by those armed bodies of men employed by the state. It was at the vigil that those same men would put the good Reverend Billy in hand-cuffs. Carry The Names was mostly promoted by social media. In Twitter and Facebook announcements, organizers of the vigil stated that “we will carry into the New Year the memory of more than 150 people who have been subjected to the tyranny of violence, in a country where racism and police brutality are pervasive. We will hold their names high for the world to see.” Hundreds of New Yorkers of all races and ages turned out for the vigil, where activist/artists from Carry The Names provided them with black and white signs printed with the names of those African Americans and Latinos slain due to racist violence. During the opening hours of the vigil the signs were held aloft as statements were made, songs were sung, poetry recited, and the names of the deceased were read out loud. Vigillers never blocked travelers at the train station. Eventually the signs were arranged in neat symmetrical rows on the station floor. The roster of victims included Emmett Till, Fred Hampton, Eleanor Bumpurs, Amadou Diallo, Oscar Grant, Akai Gurley, and Eric Garner. Interspersed with the names were other signs bearing messages of rage and sorrow: Racism Is A Deadly Force, Beware Police Brutality, Not One More, Stop Killing Our Loved Ones, Imagine Freedom, Who Will Be Next, We Will Not Forget, Don’t Shoot, Stop Killing Our Loved Ones, and When Will We Be Free? Some eighteen hours after the start of the vigil, Reverend Billy arrived. Seized by the Holy Spirit, he began to Sermonize the crowd with a homily aptly titled, Black Lives Matter. Approximately two minutes into his reflection on racial oppression in the U.S., he was arrested, hand-cuffed, and frog-marched off by the New York Police Department to cool his heels in “The Tombs,” the Manhattan Detention Complex in Lower Manhattan. The Carry The Names vigil completed its twenty-four-hour run despite the arrest, disbanding at 5 p.m. I know Reverend Billy (a.k.a. Bill Talen) as a brilliant performance artist who has dedicated his life and work towards social transformation using the arts. 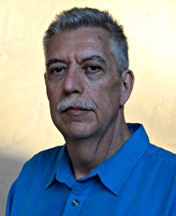 He is wholly committed to the vision and practice of non-violence, both is his street theater interventions, and in his writings. Reverend Billy and his Stop Shopping Choir are radical performance artists that stage mock revival meetings to deride and ridicule the folly of late capitalist “culture” in the 21st century. The police maintain that the Reverend’s disorderly conduct charge stemmed from his “intentionally causing public inconvenience and annoyance,” and that he had been arrested “for physically trying to block a police officer from doing their lawful duties.” I think not. His arrest was politically motivated, an act of state repression designed to squelch the free speech rights of all Americans. The Daily News reported the Reverend saying “I was handcuffed while I was speaking in the middle of expressing my beliefs in a public space. This is the most basic form of American freedom.” On Wednesday the police released the Reverend on his own recognizance. I have the highest regard and fondness for Bill Talen and what he does… though I am not in full accord with him. When all is said and done our differences do not matter, for we are kindred spirits. I will say the same for the movement that has sprung up in the U.S. in opposition to police violence against “minorities.” I shrink back from its naiveté and political disorientation, yet at its core there are incontestable truths regarding race and class in America. Ultimately, this post is not about the Reverend Billy at all. Rather it is about all of those individuals, who, despite the odds, work to uproot the poison of racist terror that continues to exist in American society. 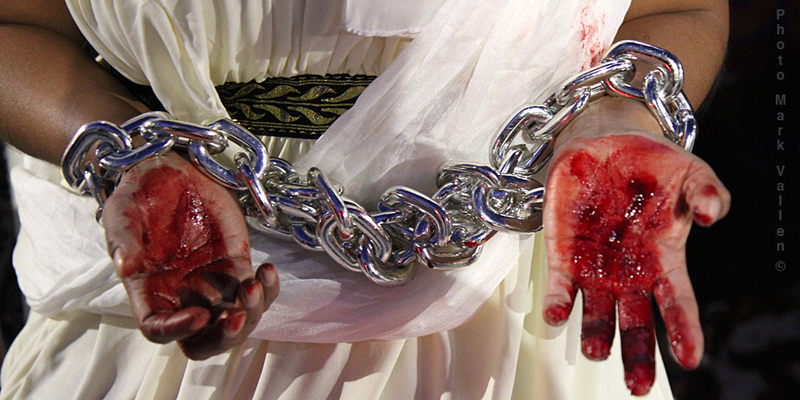 In my July 2011 article, An Exorcism at Tate Modern, I detailed a performance the good Reverend had just conducted at the Tate Modern in London to protest the museum taking sponsorship from the oil giant, BP. The article included a short video of the Reverend’s antics at the Tate, which were nothing short of inspirational and illustrative of the powerful performance art Reverend Billy and The Stop Shopping Choir engage in.